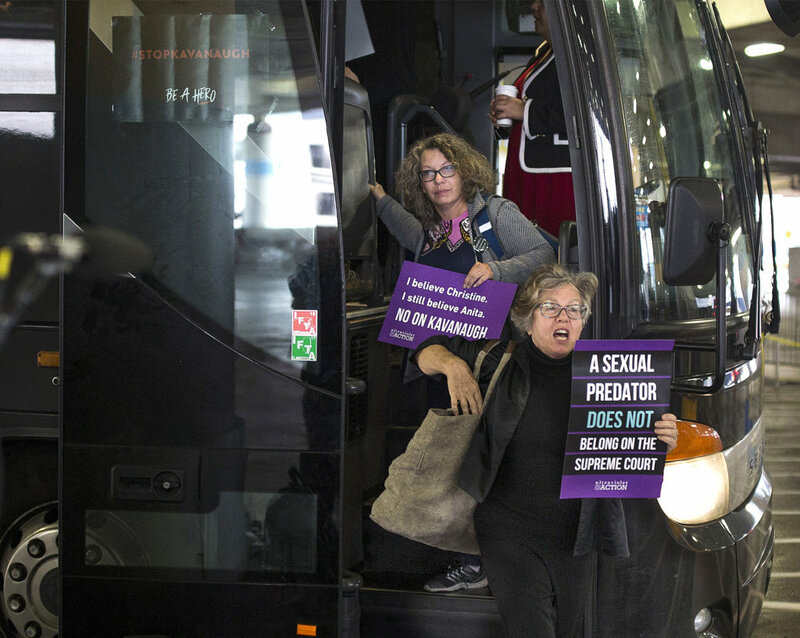 A retired University of Southern Maine professor has been barred from teaching in the UMaine system after she offered students a “pop-up” course for credit to take a bus to Washington, D.C., with demonstrators urging Sen. Susan Collins to oppose confirming Brett Kavanaugh to the Supreme Court. No campus resources were used to support the “one-sided political activism,” he said. News of the trip prompted complaints that tax dollars were used for partisan activity and the Maine Republican Party blasted the idea on its Facebook page. University officials – Cummings and system Chancellor James Page – immediately issued statements denouncing the idea and saying it violated university policy on remaining non-partisan and politically neutral. Most universities have policies around political speech, which has been debated fiercely in recent years as demonstrations or speakers on campuses across the country have created political flash-points or led to violence. Recent examples include the chaos that erupted at the University of California, Berkeley, in February 2017, when protesters set fires, smashed windows, hurled explosives at police and ultimately achieved their goal of canceling an appearance by right-wing commentator Milo Yiannopoulos. Closer to home, 200 people demonstrated at the USM campus in Portland in July 2017 to protest a lecture on immigration by Maine Rep. Lawrence Lockman of Amherst, a Republican lawmaker known for making divisive and polarizing statements. On Wednesday, Maine GOP Executive Director Jason Savage praised USM’s move to ban Feiner. Feiner said she wouldn’t have any further comment until the investigation is completed. USM is continuing to investigate how Feiner was able to advertise the course, which was done without approval from the committee of faculty and deans that reviews all pop-up course offerings. Pop-up course offerings don’t usually last for more than few weeks and students must register through a university portal called MaineStreet. Cummings said more administrative and personnel actions could be taken after the investigation is completed. Feiner retired in September, after 21 years as a tenured professor of economics, and it is common for retired faculty to continue to teach a course or two after retirement. As a retired professor, Feiner is no longer covered by the union, the Associated Faculties of the Universities of Maine. Feiner recently served as president of the USM chapter of AFUM. Feiner has been a prominent figure on the campus, particularly during the financial turmoil in 2014 that led to deep cuts and tenured professors being laid off. She was a regular opinion-editorial contributor to the editorial pages of the Portland Press Herald/Maine Sunday Telegram before then. Feiner previously defended the trip but also took responsibility for not going through the proper channels. Interviewed on the bus bound for Washington, Feiner said she works at the Frances Perkins Institute at USM, which organizes pop-up courses that are funded by a grant and offered free to students. USM spokesman Robert Stein said retired faculty are generally hired on a course-by-course contractual basis. In this case, he said, there was no contract for the course, so the university had not employed Feiner. At the time of the bus trip, the Maine Republican Party shared an email on its Facebook page that was from Gabriel Demaine, a Social Justice Community Outreach Organizer for USM’s Geography and Anthropology Department. Cummings has said it was his understanding that Feiner asked Demaine to promote the event on social media. The email to students offered course credit for taking a bus to Washington to demonstrate, and linked to an online form that asked students if they would be willing to be arrested. University professors have broad latitude in what they discuss or study under the principle of academic freedom, which allows faculty and students to raise difficult subjects in class, or research controversial topics. However, in March, the University of Maine System trustees approved a policy limiting political speech and spelled out that the publicly funded system must remain impartial to partisan political activity. Some professors and students were worried the policy could limit speech, although system officials repeatedly said the policy is aimed at people speaking on behalf of the university and isn’t intended to muzzle professors speaking as experts in their field in legislative testimony, participating in political activity on or off campus, or teaching subjects that touch on political issues. The policy says employees who wish to engage in partisan political activity should do so on his or her own time and without the resources or funds of the university.